Modern RG Scapeshift (TitanShift) is a Modern deck born out of Zendikar Standard. The deck's core strategy aims to cast an often game winning card on the player's fourth turn. The two game winning cards are Scapeshift, and Primeval Titan both of which fetch the card Valakut, the Molten Pinnacle and some number of mountains to kill the opponent with valakut triggers. This is done by packing the deck full of ramp spells and asking the question "Can you win before my Turn 4?". There is a large amount of redundancy built into the deck to accomplish this plan every game, but enough subtlety in card differences to allow you to make optimal plays. This primer will provide a high-level introduction to the deck and cover: mulligan decisions, lines of play, a general sideboarding guide, and how to play around the most common hate cards. Titan Scapeshift first has its roots in Standard back in the Zendikar-M11-SOM block where most of the components of the deck were printed, and it is when Valakut Ramp dominated the meta. Reid Duke once called it in one of his articles as "the most powerful deck in Standard". Scapeshift did not make any waves when it was first printed in Morningtide since it did not have the key component to finish the combo. Not until Extended did Scapeshift catch up to Valakut, coinciding with the dominance of Valakut Ramp in Standard. Scapeshift decks even then were differentiated into two -- the awesomely named Wargate Scapeshift; and RG Scapeshift, which as you may think, looks very similar to what our deck is now. And back then, they became the most dominant archetype of combo decks in Extended. So dominant in fact, that when Modern was first rolled out on 2011, Valakut was among the first cards to be banned. It was only more than a year later when it was unbanned, and then several builds that incorporated the Scapeshift - Valakut combo appeared. Then on the 11th of November 2015, Thien Nguyen reached 7th place (out of 2674 players) in the Grand Prix Pittsburgh which further cemented the deck as a contender, and popularized it even more. His list concentrated on the combo aspect of the deck, used Commune with Lava to find Scapeshift which overall streamlined the main deck with as little interaction as possible. Even though the deck has gone through several iterations, the foundation for Modern RG Titan Scapeshift remains based on these builds. Scapeshift : 4 copies, The single card combo with Valakut. Your goal is to cast this for lethal on turn 4. Primeval Titan : 4 copies, 6/6 trampler that fetches 2 lands to enable your combo. Can serve as an alternate win-con. You should also aim to cast this on turn 4. Summoner's Pact : 2 copies, Used to tutor Primeval Titan/Sakura-Tribe Elder and other green side-board creatures. This functions as win-cons 9 and 10. Search for Tomorrow : 4 copies, Fills in your turn 1 play by Suspending for G to find an untapped basic. Sakura-Tribe Elder : 4 copies, affectionately called "Steve". Serves as a chump blocker that also ramps. Can beat down the initial 2 damage when needed in a pinch. Valakut, the Molten Pinnacle : 3-4 copies, Main win-con. Turns your land drops into Lightning Bolts. Read “Guide to Playing the Deck” below for additional details on how Valakut works. Khalni Heart Expedition : 0-4 copies, This card makes the deck a little more explosive, and it can be a source of card advantage in certain situations. This card used to be a staple at 3-4 copies but has been getting cut from many lists recently in favor of different ramp or more flex cards. Explore : 2-4, 2 CMC Ramp and cantrip. Efficient in dumping Valakuts from your hand. Farseek : 2-4, 2 CMC unconditional ramp. Allows you to fetch out most lands in your deck outside of basic Forests (important to remember under Blood Moon). Wood Elves: 0-4, Will see play in some lists. Comes down on turn 3 as an additional blocker and will allow you to play a two mana ramp spell (given you did so on turns 1 or 2). This primer won’t cover all the card choices you can make, but will hit on some of the most common ones. Relic of Progenitus : - Used as a cantrip and incidental graveyard hate. Can be helpful in protecting yourself from Tarmogoyfs and Surgical Extractions. Prismatic Omen : Makes your Valakut math a little weird, but winning with land drops a lot easier. Also allows you to win with Scapeshift and 6 lands. This is largely a preferential card, and is included based on your playstyle. Lightning Bolt : Most versions play 4 to deal with early aggression. Meta call. Primal Command : Also used to tutor creatures (Summoner’s Pact has really taken its place), but has other useful modes such as dealing with troublesome noncreature permanents, thinning graveyards, and padding your life total. Chandra, Torch of Defiance: Planeswalker of choice. Emblem can just used as an additional win condition and the +/- modes are both supplemental to the deck’s plans. Courser of Kruphix: Most main-deckable creature to help play against aggro. Will help you filter your draws with fetches and ramp spells. For the purposes of this Primer, let's refer to a pretty basic maindeck (MD) list. This is a pretty standard list. Many users here will deviate from this, and that is completely fine. If you are looking to just build the deck, this is a good starting point. You'll also see that the flex cards can be interchanged without disrupting the flow of the deck (the additional ramp and FLEX cards are sort of lumped together). The payoff cards here are Scapeshift, Primeval Titan, and Summoner's Pact (to find Titan). These are the cards you're ultimately ramping to. For this build, you have 13 Mountains at your disposal and 4 Valakut, the Molten Pinnacle. These are the two numbers you need to remember most as they will come up every game. It is set up in such a way that you can Scapeshift with 7 Mountains on the battlefield and still have 18 damage left in your deck. This mana base also gives you the ability to activate Valakut naturally. We'll go over how the cards interact with each other in the next section. How Does This Deck Work and Win? Method 1: Resolve Scapeshift with 7+ lands; You'll need to cast Scapeshift with 7 lands on the battlefield and the ability to grab mountains out of your deck with a Valakut. This does 18 damage with 6 triggers, which is typically lethal. You have other interesting lines to take with this card, but we'll go into detail with that later. 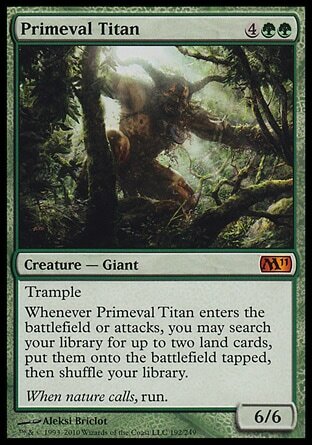 Method 2: Resolve/Attack with Primeval Titan; You’ll find Primeval Titan with Summoner’s Pact. Often times, you’ll want to grab Valakuts with Titan’s ability, or lands that would turn on Valakut. In some instances, you’ll want to grab fetchlands. Method 3: The deck plays enough basic mountains that you can grind down an opponent with land drops. If taking this approach, it is recommended that you do it with at least 2 Valakuts, as to keep your threat density reasonable. Prismatic Omen helps to get extra mileage out of the Valakut land drop and lets your fetchlands pull double duty. Method 4: This is most relevant in sideboard games, where opponents can bring in hate against Scapeshift or Valakut itself. Valakut states that whenever a mountain enters the battlefield under your control, if you control at least 5 other mountains, Valakut does 3 damage to target creature or player. This condition is what as known in magic as an "intervening-if clause". I won't go into detail as to what exactly that means, but I will go into detail as to what it means in respect to Valakut. If you are interested in learning more, here is a post on the MTG Judge Blog explaining intervening-if statements, and here is an article by level 2 judge Max Kahn explaining rules interactions in modern that highlights Valakut for the intervening if clause and has a very useful digram. Valakut's intervening if trigger means that the the trigger has to meet an additional clause in order to actually trigger and go on the stack. This is written in the form "When/Whenever/At [trigger event], if [condition], [effect]". In our case "Whenever [a Mountain enters the battlefield under your control](trigger event), if [you control at least five other Mountains](codition), [you may have Valakut, the Molten Pinnacle deal 3 damage to target creature or player](effect)". If the additional clause is not met, then the ability does not trigger. So lets say your turn 1 play is Valakut and your turn 2 play is Stomping Ground. When Stomping Ground enter the battlefield, is there a Valakut trigger that goes on the stack? No. If you were playing MTGO, the land would just come in normally with no effects. If that was your 7th land drop, with Valakut and 5 other mountains, then yes, a trigger goes on the stack because you've met both conditions. The second half of the intervening if is that the conditions are checked again on resolution of the trigger. This is how land destruction works in fizzling a lethal Scapeshift. Lets say I cast a Scapeshift sacrificing 7 lands and put 6 triggers on the stack (grabbing 5 basic mountains, a Stomping Ground, and a Valakut), but my opponent has an untapped Tectonic Edge and destroys the Stomping Grounds that just came into play. Now, each trigger tries to resolve. Basic Mountain 1 checks for 5 other mountains and only sees Basic Mountains 2-5, therefore the second check of the intervening if is not met and the trigger does not resolve. Basic Mountains 2-5 go through a similar process. Then we get to the trigger caused by the Stomping Ground. This trigger goes to resolve and DOES see 5 other mountains (Basic Mountains 1-5), therefore the second check of the intervening if is met and the trigger will resolve resulting in 3 damage. With this deck in particular, it is important to remember that cards like Khalni Heart Expedition, Primeval Titan, Scapeshift, and Harrow put lands onto the battlefield at the same time. This is more evident with Scapeshift, but when the land enters and checks for the second clause of the intervening if, it will count its buddy/buddies that were brought in with it (since these are brought in at the same time due to resolution of the previous trigger/spell). So if you have Valakut + 4 Mountains with a Khalni Heart Expedition, grabbing two mountains from that KHE will net 6 damage since those mountains will be #5 and #6 and "see" each other. Prismatic Omen is the X factor here. Omen states "Lands you control are every basic land type in addition to their other types". So roll back to when were were resolving our Valakut triggers, and our opponent used Tectonic Edge on our Stomping Ground. Basic Mountain 1 checks for 5 other mountains and DOES see them! Basic Mountains 2-5 and Valakut, since now it is considered a Mountain thanks to Prismatic Omen. This trigger will resolve and so will the others. Now if the trigger sees Valakut as a mountain under Prismatic Omen, what happens when you have multiple Valakuts? Lets say you have Valakut 1, Valakut 2, 3 Stomping Grounds, and a Prismatic Omen. You play a Wooded Foothills for the turn. Both Valakuts check to see if they should trigger, and they do. Your Wooded Foothills is a mountain and both Valakuts are mountains for the purposes of the intervening if trigger thanks to Prismatic Omen. When the trigger goes to resolve, it will see 5 other mountains and deal its damage. So how does this work with Scapeshift? When Scapeshift is cast, you can choose any number of lands you control on resolution and sacrifice them (so between 0 and however many you control). Any cards you pull out of your deck will enter the battlefield at the same time, and will follow the guidelines outlined above. So I’ve drawn my opening 7, what do I do? Now you can shift when you play your ramp spell to turn 1 if you have a Search for Tomorrow, but this is more or less the basis. A Turn 4 titan will need 2 ramp spells outside your normal land drops. Got it? Good. Once again, this is a simplification but to have a turn 4 Scapeshift you need to have 4 lands and effectively 3 ramp spells plus Scapeshift. In your 3-4 draw steps between turn 1 and turn 4, you should be able to hit a missing piece (land, ramp spell). So looking at this sequence of plays, you realize there are zero ways to either play a Primeval Titan or lethal Scapeshift earlier than turn 4. Planning your turns 1-3 and determining what you are building to is about 50% of the skill to playing the deck. This part is also super easy to goldfish, so sit down at your table and give yourself 4 turns to either cast Scapeshift or a Primeval Titan. Bonus points for a Titan that is lethal that turn (requires some luck, but can be done ;)). Sacrifice too many lands with Scapeshift: Keep track of the mountains in your deck, hand, graveyard, and exile. If you are worried about sacrificing too many lands, an option would be to sacrifice enough to get lethal triggers. An example would be if you had 2 Stomping Ground, 2 Cinder Glade, 3 Forest, and 2 Mountain. You can sacrifice the 3 Forest and 2 basic mountains for 3 Valakuts and 2 more basic Mountains to get 6 triggers (18 damage). Float Mana: Not as important in RG builds, but is good practice. If you need to have some interaction after Scapeshift resolves, float the mana you need as you cast the spell. You can only float mana when you have priority, so if you don’t and your opponent lets the spell resolve, you are out of luck (and if you try, it’s a good way to have a judge called on you). You can choose 0 as your number for Scapeshift: You do not have to sacrifice lands after an opponent resolves an aven mindcensor or shadow of doubt. Also remember sacrificing the lands you control is part of the resolution of Scapeshift, not that cast. Valakut is a may ability: If for some reason you or your creatures were the only legal target for Valakut, you can target and choose not to resolve the trigger (G/W Hexproof with Leyline of Sanctity for instance). Deflecting Palm could also cause this scenario to be relevant. Everyone has a different sideboard, and constantly changes with the fluidity of the meta. We’ll touch on some of the most common sideboard cards. For the most recent tech, see discussions in the latest pages of this forum. Anger of the Gods : Sweeper of choice. Exile effect is relevant against a lot of creature decks in modern. Obstinate Baloth : Our discard protection and lifegain beater. All around good card and fills a few roles in the deck. Nature's Claim : Goto removal for Blood Moon/Leyline. The given 4 life is rarely relevant due to the high damage output of the deck. You’ll see many other cards used in this deck’s sideboard, but these 3 are far and beyond the most common ones. We’ll talk about the general approach you’ll want to take for each matchup and sideboard cards you will want to look to bring in. The matchup here is pretty good, as the deck works differently than the angle they are trying to attack at. You can beat a lot of their normal hands, except the Discard/Goyf/Liliana, which puts a lot of pressure on you (but can be raced). Post-board, you'll want to take out any cards than can be weird topdecks or anything that can be interacted with. Khalni Heart Expedition and Anger of the Gods/Lightning Bolt are usually the first cuts, with Prismatic Omen next. Lightning Bolt isn't completely dead if you don't play Engineered Explosives in your SB, as it would be your only way to deal with an early Dark Confidant, Grim Flayer, or Raging Ravine. Obstinate Baloth is your first include, to possibly negate some discard. Simple graveyard hate like Relic of Progenitus and Primal Command can help deal with Goyf. Engineered Explosives deals with most threats in the deck at 2 CMC. You can see all sorts of cards out of the Jund SB, but usually you can count on Fulminator Mage and/or Lost Legacy. There is also a non-zero chance to see Crumble to Dust, so be vigilant with your Valakuts. I mentioned above that the way Jund decks beat ours is disruption backed by aggression. Death’s Shadow Jund and Grixis are built to do exactly that, often leading with 1-2 targeted discard spells followed by a large Death’s Shadow or Goyf/Tasigur/Gurmag Angler. Game 1s should be pretty difficult for the RG deck. If you play Lightning Bolt main, it is mostly a dead card in this matchup (so is Anger of the Gods). Lists that play 4 Relic of Progenitus have a fair amount of play because both decks rely on their graveyard. Prismatic Omen also helps because you often will not need to unleash to power of a full Scapeshift to kill a DS player, but a few Valakut triggers will do the trick (and might be easier than holding cards in your hand. Watch out for Abrupt Decay!) Post-SB, the games will play out in a similar fashion except the DS deck will have access to Fulminator Mage and another counterspell (Grixis). You’ll want to look for cards that deal with their threats: Engineered Explosives, Beast Within (splash colors give you a lot more options here). Liliana and non-targeted discard are also part of their deck, so Obstinate Baloth is a fine addition. You’ll want to cut your red-based removal (Bolt/Anger) as they are unlikely to do anything. An exception would be a copy or two or Sweltering Sun, since it can cycle as well. You don’t want to diddle around as you’ll be out of cards quickly and their threats (to our deck) can be singular. Your matchups against U-based control decks is also pretty good, as these decks typically have issues with big-mana decks. They play a lot of dead cards, and you also have the win-con of just playing your lands. You also only have to really resolve 1 spell to either win or pull very far ahead (Scapeshift, Titan). These decks also do not apply a lot of pressure, so don't rush into bad plays. After sideboard, it will be more difficult to resolve Scapeshift so fill free to cut a copy. Lightning Bolt is pretty dead, so cut those. You want to bring in cards you've dedicated to the matchup (Boseiju or Gaea's Revenge) and Obstinate Baloth (as it requires a Path to Exile to deal with). There is a small chance that these decks can play Leyline of Sanctity, but a common sideboard card is Runed Halo, which will name Valakut. Fill free to bring in a Nature's Claim at caution, but Reclamation Sage can act as an attacker in case you never see a target. Against decks with red, be mindful of Crumble to Dust. If your meta is saturated with U decks, consider the following specific sideboard cards: guttural response, autumn's veil, reverberate, gaea's revenge, thrun, and ricochet trap. The matchup against burn and zoo type decks is even to slightly unfavorable. If you are on the play, racing to a Turn 4 Scapeshift or Titan is a good line but is often slow when you are on the draw. If you are on the draw, you can prioritize cards like Lightning Bolt and Anger of the Gods to deal with early creatures. The same logic goes into the sideboard games. These decks have no way to deal with your combo, outside of Deflecting Palm (basically Lightning Helix, note the may exception on Valakut). Destructive Revelry can interact with your permanents (KHE, Prismatic Omen, Courser of Kruphix). These games only last a few turns, so you don't want to saturate your hand with win-conditons. You'll look to cut copies of Scapeshift (2-3), Khalni Heart Expedition, and maybe a ramp spell. Your lifegain cards, as well as anything that can serve as a blocker you have in your sideboard, should come in. Obstinate Baloth, Primal Command, Melira, Chalice of the Void, and Sudden Shock should be pulled in for this matchup. Your matchup here can range from slightly favorable to slightly unfavorable depending on your build. Similar to Burn/Zoo, this deck can get under a lot of your spells and key to the matchup is knowing which ones you need to remove. Cranial Plating, Arcbound Ravenger, and Steel Overseer are the main targets since Memnites and Ornithopters don't do much on their own. In sideboarding, you want to take out a lot of your slow cards and go down on Scapeshifts (as you need to interact early and drawing multiple is a shot in the foot). Look to cut 3-4 KHE, 3 Scapeshifts, ramp spells (Farseek/Explore), and any other card that doesn't do much in the matchup (Relic of Progenitus). For your sideboard, you'll be looking to Nature's Claim, Ancient Grudge, Anger of the Gods, Engineered Explosives, Reclamation Sage, and Sudden Shock to take out big threats while you work towards a Primeval Titan. Affinity decks can audible to Blood Moon and Thoughtseize in their sideboards, so be sure to have the ability to fetch for a basic Forest. This matchup is typically pretty good. They don't play anything main that interacts with our combo. Your hardest matches are the ones that involve an early Though-Knot Seer, or multiple Though-Knot Seers. A hard-casted Primeval Titan should go unanswered, outside of a Path to Exile. Post-Board, Khalni Heat Expedition can be pretty slow and Anger of the Gods is mediocre. Look to bring in Obstinate Baloth (to block) and possibly a Reclamation Sage/Nature's Claim. Bant Eldrazi has access to Stubbon Denial and Worship out of their board. The creature's aren't impossible for a slew of Valakut triggers to deal with (note that there are no restrictions on Valakut targeting Reality Smasher), but is less than ideal. Matchups against critical mass creature decks is generally favored. There is little to no interaction with you in their mainboard, and you can Lighting Bolt threats and fog damage with Sakura Tribe Elder to prolong the game in your favor. With Melira Company, note that our deck does just lose to the first half of the Kitchen Finks Combo (infinite life, and can be done at instant speed thanks to Collected Company), so you'll want to do your best and keep them off that. Post sideboard, Grafdigger's Cage is a haymaker against Melira Company as it stops the combo and 7-8 of their maindeck cards. Against other decks, its a fine inclusion as Collected Company can provide a lot of value. You'll want to look to cut cards they can interact with (Khalni Heart Expedition) and bring in additional Anger of the Gods and Sudden Shock. The same idea applies to most of these decks in sideboarding (note most of these decks have access to Spellskite). Sudden Shock against these decks prevents regeneration from Ezuri in Elves or value from Viscera Seer in Junk. With Kiki-Chord, Cage only stops Chord of Calling and the creatures can beat down more effectively (Restoration Angel). Aside from that, the deck is slow to get going so don't be afraid to take the first turn or two with your foot on the gas. Many of the same ideas apply to the Vizier Combo deck, except you don’t auto lose to the infinite mana combo (the deck needs a payoff card like Walking Ballista, or something to find it, to dump mana into). Your matchup against anything not named "Ulamog" is pretty good in these decks. They don't interact with your combo very well, but also don't take damage from their lands so you'll need to find a way to knock them down to 18 or get some shots in with STE). Eldrazi Tron is similar to Bant Eldrazi except your chances of seeing TKS on turn 2 are much slimmer (as they'll have to have both Temples naturally). In RG Tron, the only cards that matter to you are Karn and Ulamog. A turn 3 Karn stripping away a land then your hand can be difficult to deal with. Sideboarding for these decks is pretty straight-foward. Lightning Bolt doesn't do too much here other than go to the life total or a Karn that has -3'd. If you have mainboard Anger of the Gods, it does nothing so take it out. You'll be looking to Crumble to Dust, Ancient Grudge, and Nature's Claim in your sideboard for both Tron and Eldrazi. Nature's Claim will allow you to snipe Expedition Maps on the draw. Against Eldrazi, there is some consideration for additional cards like Primal Command but these decks choose to go bigger than their Bant brethren. They'll have access to Walking Ballista/Basalisk Collar and artifacts in the SB, so your Grudges should find targets. Both decks gain access to Warping Wail post-SB, which you should be aware of. I mentioned above that your matchup with critical mass creature decks is pretty good. Merfolk is better because they aren't threatening to combo you into submission. You'll want to manage the board so that your Lightning Bolts and Anger of the Gods can still have targets (i.e, no X/4 butts). Valakut can target Master of Waves, and is pretty much your only want to deal with it. Kira, the Great Glass Spinner also poses challenges as it also counters your Valakut trigger (if you are using those to target things). Spreading Seas usually isn't an issue, just be sure to grab enough green sources when you are fetching and such as to not get yourself locked out of the game. You can get into some hot water if you are using your Valakuts naturally, be weary of Spreading Seas shutting that plan off. Merfolk decks can have a variety of sideboards. Generally, you'll see Negate or some other sort of countermagic come in. Some players also choose to play Tectonic Edge in their sideboards. You'll look to cut some slow cards and ramp spells (Khalni Heart Expedition, Farseek/Explore, 1 Scapeshift) and bring in your mid-range cards like Anger of the Gods, Sudden Shock, Engineered Explosives. If you are looking for more cards to side in, a Nature's Claim isn't out of the question as you can nail an Aether Vial, Spreading Seas, or hero Spellskite (isn't played often, but they can play the U mana which can throw your math off). Your matchup here ranges from Unfavorable to Unwinnable. Game 1, you don't interact with their combo. Phyrexian Unlife is an effective "gain 10-12 life". They can burn additional combo pieces (Angel's Grace) to negate your Scapeshifts and their combo wins at instant speed. Game 1, you shoot for a Turn 4 win and cross your fingers. Post Sideboard, your matchup is still unfavorable but you can bring enough disruption to keep yourself in the game. Nature's Claim, Krosan Grip, and Ancient Grudge interact with their fast mana and Phyrexian Unlife. Post-board, they have access to 4 Leyline of Sanctity which you will need to plan for. Spellskite can also redirect Lightning Storm, which leaves the Laboratory Maniac win-con. Another strategy is to be aggressive with Crumble to Dust and target the lands that are 4-ofs in the deck (Seachrome Coast, City of Brass, Gemstone Mine)The best strategy against this deck is to hope to avoid it at your GP. The matchup against RG is 50/50 and depends on who is on the play. If you are on the play, focus on getting your combo off on turn 4 since both of you are goldfishing. If you are on the draw, still focus on getting a turn 4 combo. You can potentially disrupt your opponent by double bolting their Primeval Titan, but that's really all the interaction you have. Post-board, you'll follow the same strategy. Obstinate Baloth and lifegain cards don't do too much, as both of you will continue to focus on the turn 4 combo. Primal Command and Crumble to Dust are effective in this matchup, and you should be looking to ineffective MB cards (Anger, Relic). Your Sudden Shocks can be swapped in for Lightning Bolts in the event that your opponent casts a Sakura Tribe Elder and passes the turn. Against U based Scapeshift variants, being on the play is super helpful. You're a bit unfavored since their control plan lines up well against our strategy (counter/counter/combo). A lot of the tips above still apply, and your sideboard still isn't built for this. Primal Command is more of a liabilty, though Crumble to Dust is more effective. Boseiju would help your Scapeshifts and ramp spells resolve, and your life total isn't pressured. Your matchup here can swing from slightly favored to slightly unfavored. The games where you are most backed into a corner are where an early flipped delver is attacking your life total and you are tempo'd out of the game (this can happen a lot on the draw). Grixis versions will try and land an early Tasigur or Gurmag Angler, which you can fog with STE. Most versions will build up an army with Young Pyromancer. Post-SB, you're gonna look to Obstinate Baloth to pad your life total. Extra spot removal (Sudden Shock) and graveyard hate (Relic of Progenitus) can also come in handy. There is also a decent chance that the Delver deck will side into Blood Moon, so you either need to bring in an answer for it or side in a more midrange deck. Your matchup against the GW Hexproof deck ranges from even to unfavorable, and you'll look to rely heavily on your SB. In game 1, Rancor can invalidate your strategy of fogging damage with STE and their general goldfish is about turn 4. If you maindeck Anger of the Gods and are on the play, you have a shot of sweeping their creature with any two enchantments as long as one of those isn't Ethereal Armor (though Ethereal Armor and Rancor would work). Post-SB, they have access to a full set of Leyline of Sanctity. Some lists also will bring in a Gaddock Teeg, which you have to deal with. Nature's Claim and Reclamation Sage are auto-includes. If you are packing cards like Engineered Explosives, Back to Nature, or Fracturing Gust that can sweep multiple cards at once, you definitely want to see them here. The matchup essentially comes down to who outraces the other, so you need to win that battle and also deal with Leyline. Overall the matchup is ok. You will need a way to keep them from profitably Storming (Lightning Bolt for the enabler) or a way to keep them from interacting with their graveyard (Relic of Progenitus). The deck doesn’t play much countermagic outside of Remand, so keep that in mind. In your sideboard, you’ll want to look to cards that add to your strategy of game 1 (deal with the creature, clean the graveyard). Cards like Anger of the Gods or Sudden Shock can help with that (note Baral has 3 toughness). Grafdigger’s Cage is a great option that can shut off Past in Flames and force them to Gifts suboptimally. From their sideboard, you should be very cautious of them playing a Blood Moon on turn 2 (powered out by rituals). So bring in your Enchantment hate and keep a hand where you can quickly have access to a Forest. We’ll talk about the most commonly played hate cards below and how to best play around them/sideboard for them. Click each spoiler tag for the individual discussion. With enough practice, you can learn to play around Spellskite pretty easy. For Valakut triggers, Spellskite essentially turns each trigger into a shock rather than a bolt. Therefore, to win with an opponent at 18 life and a Spellskite, you will need to put 9 Valakut triggers on the stack. If your opponent can pay U mana for any of the redirections, you'll have to readjust your math. Important to remember with Spellskite is its ruling "6/1/2011 If Spellskite leaves the battlefield before its ability resolves, the targets remain unchanged." This means that when Spellskites rediction activations are placed on the stack, if you can interact/destroy Spellskite (Nature's Claim, Ancient Grudge), then those redirections with fail to resolve and your Valakut triggers can go whenever you intended to send them. Spellskite will typically show up in creature decks trying to protect combo pieces or beaters (it will be more of a headache in this aspect). This prevents your Fetchlands and Valakut from working, and gives you a lot of mountains. Blood Moon itself has a plethora of interesting interactions involving layers, which I won't repeat here, so go and read up on them. Learning to sniff out a Blood Moon is the first step in learning how to combat it. Is my opponent playing Fast Lands, Man-Lands, or utility non-basics?. If yes, then a Blood Moon is unlikely. The exception here is Affinity. Is my opponent fetching non-mountain basics post board? If yes, Blood Moon is likely. Neither of these rules are hard and fast, but should give you a good indicator of if you are going to see a Blood Moon or not. Not many decks in modern play Blood Moon in the main (Blue Moon, RG Ponza), meaning you'll unlikely see it Game 1 but plenty play it in the sideboard. Ok, so how do you combat this? The absolute simplest thing you can do is prioritize getting a basic Forest on the battlefield. Though your finishers require two green mana, all of your ramp spells only require G and can be used to find your other basic Forests (Search for Tomorrow, Sakura Tribe Elder, etc). That way you can find your two basics and still play Primeval Titan/Obstinate Baloth. Remember those interesting interactions with layers I mentioned? Versions that play Prismatic Omen have an extra interaction to consider. Some effects of Omen and Blood Moon affect the same layer. Blood Moon strips non-basics of abilities and sets their types to Mountain. Omen sets the types of all lands you control to every type. Therefore it depends on their timestamps. If Blood Moon is played, then Omen, your non-basics would still lose all their abilities but all your lands could tap for any color. If Omen is out, then Blood Moon is played, then your non-basics lose their abilities and are assigned the type Mountain. Note that your basics are unaffected by the assigned typing of Blood Moon and can still tap for any color no matter when Omen is played. You'll mainly combat Blood Moon in your sideboard. You can bring in alternate win conditions (something that can win through Blood Moon) such as Inferno Titan, Obstinate Baloth, Tireless Tracker, etc., but also you can bring in enchantment removal like Nature's Claim or Reclamation Sage. Enchantment removal is a good option to rely on if you only expect 1-2 Blood Moons in your opponent's 75, otherwise you'd want to lean heavier on cast big dumb green creatures. 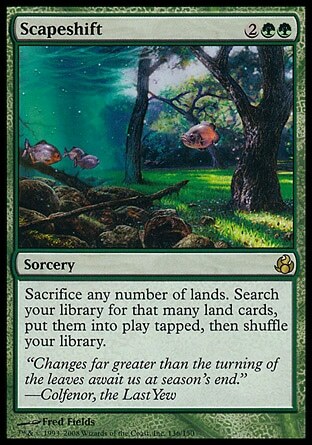 If your list plays Farseek, fill free to cut those during sideboarding as they do not grab basic Forests. If you get caught in a Blood Moon, you can Scapeshift away your mountains and go grab fetchlands from your deck (which are also mountains) to thin your deck and increase your live draws. This one prevents you from targeting an opponent (e.g. the one you're trying to kill) and can come out of the gate on turn 1. LoS doesn't stop your lands/Valakut from working, it just prevents you from targeting player 2 with those triggers. In games where there is a LoS on the battlefield, you'll rely on Valakut to bat cleanup and clear the board to make way for Primeval Titan. Important to remember is that the Valakut trigger is a may ability. It has to go on the stack and it has to target something, but if you control the ability you don't need to resolve the trigger. Also, LoS prevents you from targeting opposing planeswalkers, as you have to target the player and redirect the damage. The same logic that applies to Blood Moon applies here in regards to Side-boarding. You'll want to bring in some threats that win in the combat step, and some NC/Rec Sage in case you need it. No decks play Leyline of Sanctity in the main-board (exception RW Prison), but plenty of decks play it post board. Decks that can cast it if drawn (W decks) are more obvious candidates. GW Hexproof and Ad Nauseam play four 4 in their sideboards. If you read part 1 of this primer, then you are aware of how Valakut's interveneing/if clause works. Land destruction not only can set you back a turn but also keep you off colors and fizzle your combo if you are not careful. There is no real way to "play around" the three cards listed, other than to maintain a board of basic lands. GQ does not check if it the land is basic or not, so grab enough green sources to keep yourself in the game. If you are Scapeshifting into a live Tec Edge/Ghost Quarter/Fulminator Mage, then you have to be aware of how your triggers will resolve (players of RUG Scapeshift will have a better idea of how to do this, since that deck played less mountains). In the case of Tec Edge/FMage, they must target a non-basic mountain in order to fizzle any triggers (as destroying Valakut does nothing). Your two options will be to either grab lethal lands+1 so that your triggers will resolve, or Scapeshift for all basic Mountains (tricker but do-able). In the case of Ghost Quarter, be sure to leave a basic mountain in your deck when Scapeshifting to search out, so that your other triggers do not fizzle. In Sideboarding, there is no real way to combat this other than bringing in some beaters if you think Scapeshift will be a long shot. Sudden Shock can sometimes get a Fulminator Mage who's owner left it back, but it's a niche case. Fulminator Mage usually is played by grindier decks (Kiki-Chord, Jund). Most decks can fit in Tec Edge or GQ if they wanted to, which would be mainboard. Either of these cards targeting your Valakuts isn't ideal. You still have the ability to win through damage (Big Dumb Green Creature spam), but now you have a few dead cards in your deck (Scapeshift, if you left some number in post-SB). Either of these cards targeting Stomping Grounds/Cinder Glade isn't that big of a deal other than just setting you back a land. There is no specific sideboard card you can have to combat this proactively (only Heroic Intervention comes to mind), but the best play is to simply hold Valakut as long as you can in your hand and wait until you can get multiple on the battlefield, if you are suspecting either of these cards to be cast against you. You can be proactive in sideboarding and bring in your cards that do not rely on Valakut. Some list sometimes include a single Kessig Wolf Run to get value out of your lands. You just can't play around lobotomy effects. These are almost never played mainboard, but in the sideboarded games where you'd see them, you should be bringing in extra ammo anyway (beaters). This one is separated from the other lobotomy effects because you actually can play around it. If your list has Relic of Progenitus, you have the luxury of voiding the target if you choose to (tap Relic to target yourself or just exile everything). Surgical also requires that Valakut/Scapeshift/Primeval Titan be in your graveyard so be smart about what you discard, if you have the option, or when you play Valakut (has to be destroyed). The sideboarding strategy still holds true, bring in varied threats. Only a handful of decks play this card, but it does come in against you. Its easier just to deal with the enchantment itself, but setting up a large amount of Valakut triggers to deal with said creatures is also an option. Adding an additional color is pretty easy in the deck, between the number of fetches played and the individual search effects (Sakura Tribe Elder, Search for Tomorrow, Farseek). Currently the most popular splash. Your splash is for hard removal to increase your winning percentage against decks that are resilient to damage based removal. November 27th, 2015 - Ari Lax on Magic Online - Ari Lax with 5 matches using G/R Scapeshift. December 14th, 2015 - Channel LSV - Modern RG Scapeshift - Luis Scott-Vargas plays 4 matches with RG Scapeshift. January 8th, 2016 - Deck Tech by Felix Tse - Video discussion of Face To Face Open Toronto winner Felix Tse's deck list. January 8th, 2016 - RG Titan Scapeshift vs Abzan Company - Quarterfinals of Face To Face Open Toronto. Pro Tour Oath of the Gatewatch - Thien Nguyen discusses his 8-2 run on the Modern Pro Tour. SCG Regionals Modern - Richard Meshell (aka nookularboy) on his 7-2, 22nd place finish on the Regionals. RG Scapeshift Primer - Thien Nguyen’s primer for Mana Deprived. Covers additional matchup strategy. /r/Scapeshift Subreddit - Subreddit dedicated to the archetype. Covers all builds, but has a lot of discussions on RG. I don’t want to publish people’s actual names, but a huge shoutout to those in the MTGSalvation and Reddit communities for pulling the hivemind together and providing comments on the draft version. I’m sure as this primer is continually updated, we’ll add more names here. Modern RG Scapeshift (TitanShift) is a Modern deck born out of Zendikar Standard. The deck's core strategy aims to cast an often game winning payoff card, either a Scapeshift or Primeval Titan, on the player's fourth turn. This is done by packing the deck full of ramp spells and asking the question "Can you win before my Turn 4?". There is a large amount of redundancy built into the deck to accomplish this plan every game, but enough subtlety in card differences to allow you to make optimal plays. This primer will cover: provide a high-level introduction to the deck, mulligan decisions, lines of play, a general sideboarding guide, and how to play around the most common hate cards. Titan Scapeshift first has its roots in Standard back in the Zendikar-M11-SOM block where most of the components of the deck were printed, and it is when Valakut Ramp dominated the meta. Reid Duke once called it in one of his articles as "the most powerful deck in Standard". Scapeshift did not make any waves when it was first printed in Morningtide since it did not have the key component to finish the combo. Not until Extended did Scapeshift catch up to Valakut eventually, which coincided with the dominance of Valakut Ramp in Standard. Scapeshift decks even then were differentiated into two -- the awesomely named Wargate Scapeshift; and RG Scapeshift, which as you may think, looks very similar to what our deck is now. And back then, they became the most dominant archetype of combo decks in Extended. So dominant in fact, that when Modern was first rolled out on 2011, Valakut was among the first to be banned. It was only more than a year later when it was unbanned, and then several builds that incorporated the Scapeshift - Valakut combo appeared. Scapeshift : 4, The single card combo with Valakut. Your goal is to cast this for lethal on turn 4. Primeval Titan : 4, 6/6 trampler that fetches 2 lands to enable your combo. Can serve as an alternate win-con. You should also aim to cast this on turn 4. Search for Tomorrow : 4, Fills in your turn 1 play by Suspending for G to find an untapped basic. Sakura-Tribe Elder : 4, affectionately called "Steve". Serves as a chump blocker that also ramps. Can beat down the initial 2 damage when needed in a pinch. Valakut, the Molten Pinnacle : - 3-4, Main win-con. Turns your land drops into Lightning Bolts. Read “Guide to Playing the Deck” below for additional details on how Valakut works. Khalni Heart Expedition : 3-4, This card makes the deck a little more explosive, and it can be a source of card advantage in certain situations. Wood Elves: 1-4, Will see play in some lists. Comes down on turn 3 as an additional blocker and will allow you to play a two mana ramp spell (given you did so on turns 1 or 2). Lightning Bolt : Most versions play 4 to deal with early aggression. Meta call..
Summoner's Pact : Used to tutor Primeval Titan/Sakura-Tribe Elder and other green side-board creatures. Most versions now play 2 mainboard. This is a pretty standard list. Many users here will deviate from this, and that is completely fine. If you are looking to just build the deck, this is a good starting point. You'll alos see that the flex cards can be interchanged without disrupting the flow of the deck (the additional ramp and FLEX cards are sort of lumped together). The payoff cards here are Scapeshift, Primeval Titan, and Summoner's Pact (to find Titan). These are the cards you're ultimately ramping to. Valakut states that whenever a mountain enters the battlefield under your control, if you control at least 5 other mountains, Valakut does 3 damage to target creature or player. This condition is what as known in magic as an "intervening-if clause". I won't go into detail as to what exactly that means, but I will go into detail as to what it means in respect to Valakut. Valakut's trigger is an intervening-if, meaning that the the trigger has to meet an additional clause in order to actually trigger and go on the stack and is written in the form "When/Whenever/At [trigger event], if [condition], [effect]". In our case "Whenever a Mountain enters the battlefield under your control, if you control at least five other Mountains, you may have Valakut, the Molten Pinnacle deal 3 damage to target creature or player". If the additional clause is not met, then the ability does not trigger. So lets say your turn 1 play is Valakut and your turn 2 play is Stomping Ground. When Stomping Ground enter the battlefield, is there a Valakut trigger that goes on the stack? No. If you were playing MTGO, the land would just come in normally with no effects. If that was your 7th land drop, with Valakut and 5 other mountains, then yes, a trigger goes on the stack because you've met both conditions. The second half of the intervening if is that the conditions are checked again on resolution of the trigger. This is how land destruction works in fizzling a lethal Scapeshift. Lets say I cast a 7 land Scapeshift and put 6 triggers on the stack (grabbing 5 basic mountains and a Stomping Grounds), but my opponent has an active Tectonic Edge and destroys the Stomping Grounds that just came in. Now, each trigger goes to resolve. Basic Mountain 1 checks for 5 other mountains and only sees Basic Mountains 2-5, therefore the second clause of the intervening if is not met and the trigger does not resolve. Basic Mountains 2-5 go through a similar process. Then we get to the trigger caused by the Stomping Ground. This trigger goes to resolve and DOES see 5 other mountains (Basic Mountains 1-5), therefore the second condition is met and the trigger will resolve resulting in 3 damage. With this deck in particular, it is important to remember that cards like Khalni Heart Expedition, Primeval Titan, Scapeshift, and Harrow put lands onto the battlefield at the same time. This is more evident with Scapeshift, but when the land enters and checks for the second clause of the intervening if, if will count its buddy/buddies that were brought in with it (since these are brought in at the same time due to resolution of the previous trigger/spell). So if you have Valakut + 4 Mountains with a Khalni Heart Expedition, grabbing two mountains from that KHE will net 6 damage since those mountains will be #5 and #6 and "see" each other. New official location for RG Titanshift. Primer looks good. What I'd change is the "Flex Spots and Other Main Deck Card Choices", I'd move Khalni Heart Expedition there (it's not really a sure thing in the main anymore), I'd remove Commune with Lava (no one has played that in a long while) and I'd add Chandra, Torch of Defiance, Wood Elves, Anger of the Gods and Courser of Kruphix since most decks run at least some of those cards. Not sure if this thread is the right thread for it (since it's RG Titanshift), but we may want to consider a small section on the jund version? It's been putting up some results and more options / discussion is always welcome. I think this is the right thread for that since the old RG Titan Shift thread had a lot of discussion about the Jund build. I cut Explore completely and am trying Wood Elves and KHE instead. So far, Wood Elves has been decent. In my last game, it traded with a Vendilion Clique because they wanted to stay above 18 life. I have yet to draw KHE so I can't give any comments to it, yet. I have been testing Jund and Jund+Blue for BtL, and it's surprising how much harder it is to get the mana right. It's really bad with BtL since it's 4-color, but even with Jund, I often find myself taking extra damage or having 1 too few Mountains... Not saying Jund is bad, just different. I can see the reason people like it, though. It's great to be able to stall with some removal. I'm going to keep running my mono-green maindeck in Leagues but messing around with splash colors for fun. I started out with 4 Cinder Glade and 2 Stomping Ground, but have moved to 3/3 to give extra chances for turn 1 Search. I am considering a 2/4 split, but I like having the late-game Glades to fetch up. Why does the deck run so many basic Mountains? I realize we need some for STE, Search, and KHE (if we run it). However, it seems like we would rather start with 4 Stomping Ground, 3 Cinder Glade, and fill in from there. In other words, cut a Mountain for a Stomping Ground. - We still keep 13 Mountains which is a good magic number. - We get extra ways to play turn 1 Search which is very important. - We gain an extra source of green mana to help cast double-ramp. - Stomping and Mountain function the same under Blood Moon, so that is not a concern. - Stomping gives us an extra mountain to fetch with our other green fetches. - Our mana base gets SLIGHTLY more painful. - Thread name changed to RGx. Seems warranted at this point. - Added a section on splash colors. Not a lot of detail there at the moment, but its more of a placeholder. - Took out TN's GP Pitt list and added a more recent one. Still would like to leave the PT list (sort of a merit thing). - Added Chandra Torch of Defiance, Courser of Kruphix, and Wood Elves to Flex/Ramp Cards. Removed Commune with Lava. - Took KHE out of "stock" list. These are good suggestions. Some should have been made when the primer was open for comment for 3 weeks, but that's fine. @Duramboros : The sections were broken down with intent; Core, Ramp, Other. KHE still falls under ramp, and plenty of people still play it. @wtyyy, @AxelStollScientist: I agree, we should also hit on the other colors. There is a new section added to document that. @Lejoon : Added a jund/splash color section. We can add more to it if it becomes pertinent. Also heavily disagree with your last statement. With the exception of TN's PT list (left that in on purpose), these are all from large tournaments in the last two months and are only meant to be sample decklists to showcase some finishes anyway. The skeleton list is meant to be just that, a skeleton list to explain the core of the deck which is a handful of ramp spells and Scapeshift/Titan. It would also be nice to beef up the tournament reports section. If you are going to GP Copenhagen, GP Kobe, GP Vegas, or SCG Baltimore/Charlotte/Roanoke or have a large local tournament (my area has a few Team events coming up) and are interested in doing a detailed report, message me and I'll give you an idea of what I'd be looking for. This is a pretty new idea as I'm reading back over the primer, so I'll need to iron some details out. I love reading detailed tournament reports, so I love the idea! I only play FNMs in paper and Friendly Leagues Online. While they are not the most exciting tournaments, there is still value in reading someone's thought process throughout the course of a game. I may try writing up some in the comments and see if people get any value from that. I'm excited about the new primer. Thanks to nookularboy for helping us out with this. I have yet to have a chance to read the entire thing through but I want to respond to a few peoples comments. @lejoon, I know you pioneered the Jund list, and I thank you for that as I have been having much more success with it than RG. However, I would caution you to not assume you are the first to use Prismatic Omen as you suggested in your post since it has been used and talked about almost as long as Titanshift has been a thing, and has been used in OmenShift (a RUGShift variant) even longer. @coinmagic45, As for the large number of basic mountains, it's a necessary evil in my eyes. Any time you get into a grindy matchup and need to win with Valakut triggers over multiple turns, you have to have a high basic mountain count. It's one of my biggest issues with Jund right now as I use KHE instead of Prismatic Omen. I have lost games because KHE couldn't do anything when I ran out of mountains. Now, that may just be another argument against KHE, and I really want to test Prismatic Omens I just can't find anyone in Chicago with them. Even without KHE, you really need as many top-decks as possible live in the late game so keeping basic count high leaves STE, SFT, and KHE live. @Lejoon again, I see nothing wrong with using Cory Gorman's list. The fact that it placed highly is really important to the efficacy and implied legitimacy of the primer. Also, using non Verdant Catacombs green fetches is fine. Sure verdant catacombs is strictly better, but it is a very slight edge. Although, putting a comment on his list suggesting Catacombs is probably prudent. I read in the matchups section that the deck's U/x control MU is favorable. How is this possible? From my experience this is always a miserable match up for me. Am I doing something wrong? Are there any tips you guys can share on how to sideboard and play for this MU? thanks. So, the big reason we have a good matchup on control is the inevitability of our deck. Even with only 10 'wincons', they can't counter all of them and they can't counter land drops. If you are struggling, I suggest trying to set up a valakut plan every game. If they let a Titan resolve, they probably plan on killing it immediately so use it's trigger to get 2 valakuts. Then, you can set up 5 mountains with fetches and ramp to turn all further mountains into 6 damage. For sideboarding, I suggest cutting a scapeshift or two as they tend to bring in negate and replace them with creatures. Then, if you are still struggling, Thrun, the Last Troll destroys them. They can't kill it. For basic strategy against that matchup, theres no rush. Attack for 5 damage with Sakura Tribe Elder if you can. I killed someone on Jeskai Control with 3 STE's once. They did 15 points total and his lands did the rest. Get an early valakut or Baloth or any kind of threat in play and then just cast ramp spells and force them to deal with it before committing another one. You don't need to take risks, because they don't have the same inevitability we do. When you take risks and try to win fast, they'll have the counter and you'll be out of cards and threats. Tireless Tracker was basically made for this matchup. Essentially what spike said. I do want to note that particular portion was written before UW control started jamming 4 ghost quarters and surgical extractions. You aren't under huge pressure to win quickly here. Work on developing your board, and try and set yourself up where you can resolve 2 things a turn (you'll typically hit a counter, but not 2 unless they are lined up just right). Tireless Tracker, Thrun, Prismatic Omen, and whatever garbage you can bring in from the SB is how you'll win this game (you basically just want to overload their counters and get mileage out of your land drops). Its not an auto-win for sure, it takes practice. Jund only runs 8 basics (1 Swamp, 5 Mountain, 2 Forest), whereas RG currently runs 10 (7 Mountain, 3 Forest). I think that's why you are having difficulty with KHE - you just have too many cards fighting for those 8 basic lands. I agree with your assessment that Omen is probably better here. For RG, that makes sense about keeping as many cards as possible "live" late-game. I feel confident I could do that with 6 basic Mountain plus 7 non-basic. As always, you need to carefully keep track of how many of each land you have left in the deck. Come to think of it, I should probably keep a notepad as I'm playing Online and record exactly what lands are left in the deck each game. That would save some headache in later turns when I need that information. UW Control CAN kill Thrun with Blessed Alliance. I doubt they would leave that in against, but they may bring it back for game 3 if they saw Thrun game 2. Just a heads up. You are, of course, right about that being a weakness of Jundshift. And something alleviated by Prismatic Omen. It just means I have to be very careful. Edit: yes blessed alliance could get thrun. That's just another reason to attack with STE and be careful. Yeah, I think I would run 2-3 Omens if I played Jundshift, but KHE feels better to me in RG. Maybe I'll buy Omens again for when I'm playing around with Jund. This is exactly what I meant, GQ and the surgical are just too much. What do you think of Gaea's revenge out of the SB or is thrun better? This is exactly where Explore shines. If you suspect GQ+Surgical, then wait until you can get 2 Valakut into play at the same time (Explore, Titan). That way, they can't GQ+Surgical you. They need double GQ. Personally, I'd rather have something like Tireless Tracker that can come in against grindy midrange decks, too, rather than a narrow card like Thrun or Gaea's... Even if they answer Tracker, he will draw you more cards, whereas Gaea's can be killed with Supreme Verdict. Another spicy option is Detritivore. I've always wanted to get him into a Modern deck. Suspending him for 3 or 4 will really tax their mana. Chandra is also great as an alternate win condition. Both are fine. I was jamming Gaea's Revenge in the Sb for a while, and it did close out some games. If you have to pact for it, you're likely to get the pact to resolve as most people would just rather counter whatever you grab with it. I don't think you worry about Verdict in post SB games, I would actually hope my opponent leaves them in. As for Thrun vs Revenge, depends on how you want to build your SB. I liked Thrun against Midrange jund, and can also just come in for those "I need extra creatures" matchups. You know what? I didn't even know that Thrun has hexproof, and I own 2 of them! I think then Thrun is much bettter since he can come down earlier to start the beats. I'm even thinking of just to straight up main deck him since my LGS has a lot of U/x control.